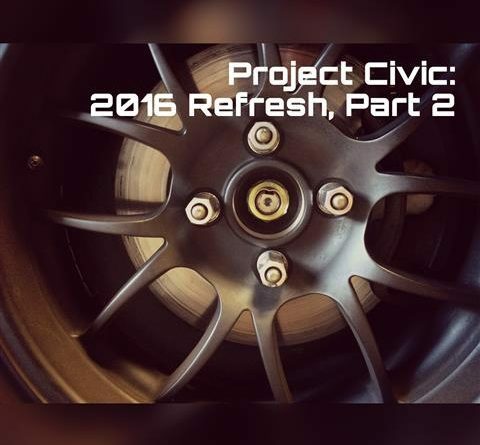 Following the 2016 refresh and having addressed all of the stumbling blocks I encountered, I realized that I needed to develop a long term plan based on how I use the Civic. Building an engine that makes huge power sounds like a blast but what will I gain? I run very competitively at my local autocrosses but realize that I would be pounded at a national level. Will I ever run nationals? If I do, will it be to win at nationals? I may venture out to nationals for the experience but I won’t make it my life’s work. I don’t need the most powerful, best handling car in my class if I’m just heading out for fun. Also, if I target big horsepower, I will have to bump up tire sizes and upgrade more of the suspension. All of this is considerably expensive for minimal gains. Worst yet, it is a huge sunk cost that I could never recover if I decided to sell that car. With that in mind, I knew I needed to draw a line…a stopping point where more money isn’t going to give me more value. I would continue to maintain the car and replace work/broken parts as necessary but not have plans for huge upgrades. What was that line? 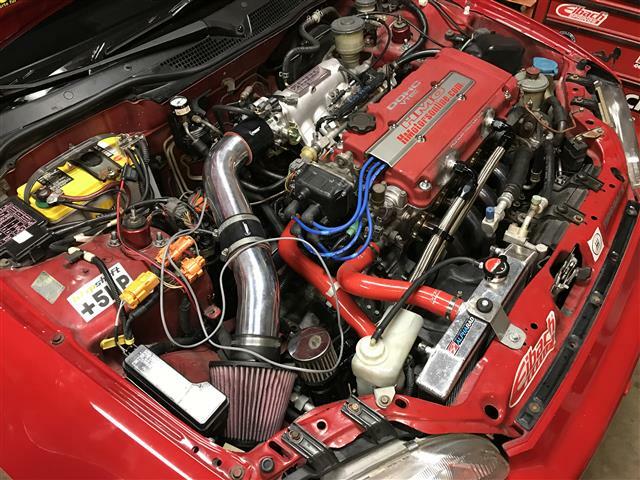 I spoke to Mikey Singhaseni of Mspec Tuning fame. I explained my intentions and we came up with a plan. He explained that the older engine computers do not have the ability to properly compensate for breather modifications and tend to run lean when breather modifications are introduced. Knowing that, I decided to install a Hondata equipped ECU. 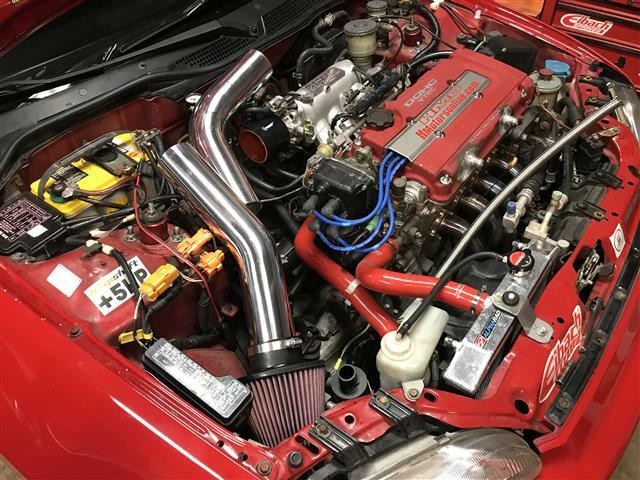 After that, he recommended a fresh set of injectors to replace the 20+ year old OEM units, an aftermarket intake manifold and throttle body. He also strongly recommended a wide band O2 sensor. The bulk of the parts. Intake manifold, throttle body, ECU, injectors and misc bits and pieces. 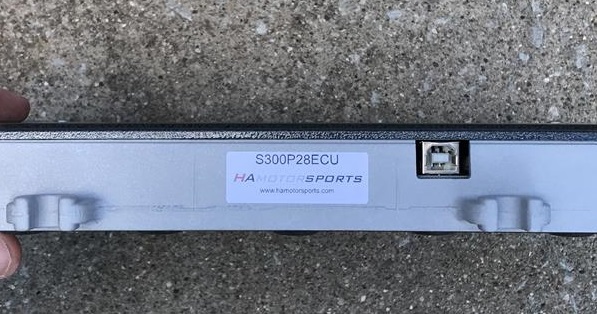 Rather than install the Hondata on my vintage P72 computer, I elected to buy a refurbished and modified P28 from HAmotorsports. They claim to replace components and then run the ECU through a simulator to verify proper operation. Bonus: The ECU looks brand new with an excellent finish! 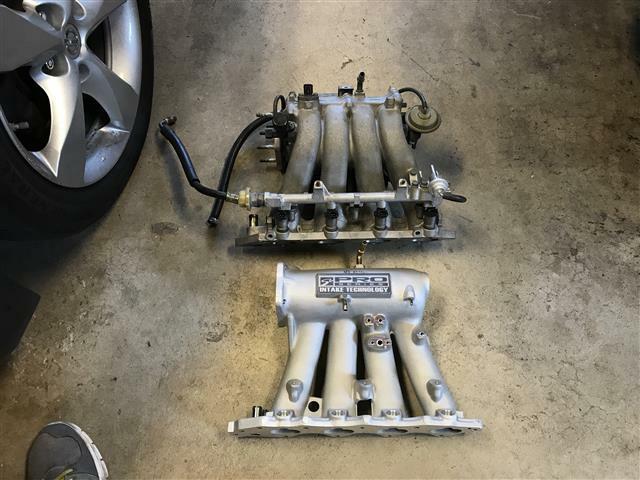 I wasn’t surprised to see the how much slimmer the new manifold was compared to the original dual runner intake manifold. 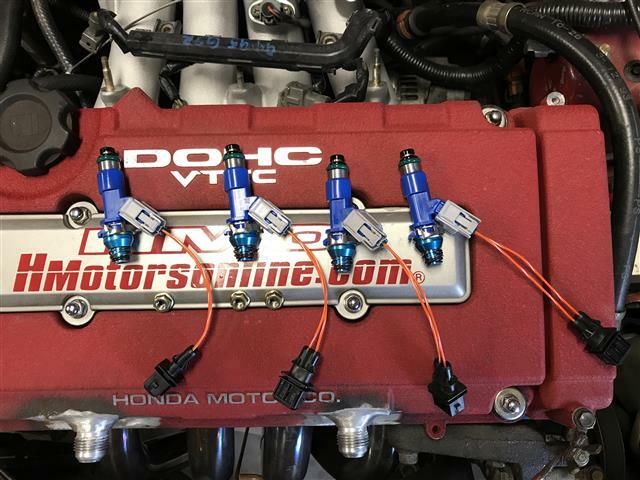 I chose a set of OEM RDX injectors. It is a somewhat less expensive alternative that I hope would provide OEM Honda reliability. I bought them along with the harness plugs and adapters through Xenocron tuning. Installing the intake manifold and throttle body is very straightforward. The RDX injectors will drop right in with the adapters. I pulled the PCV port, tapped and plugged the hole since the engine is vented. Wrapping up this part of the project, I installed the new throttle cable and attached all of the vacuum lines, fuel lines and injector plugs. 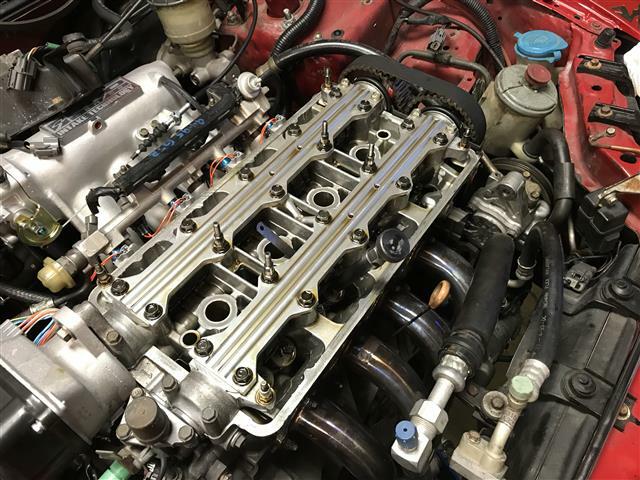 After I configured the Hondata with the new injector specs, the engine started and ran smoothly. Knowing the breather lines would interfere with the air intake’s new location, I elected to move the can down by the transmission mount. B&R’s breather can has a nice mount welded to it that makes it very challenging to install…anywhere. 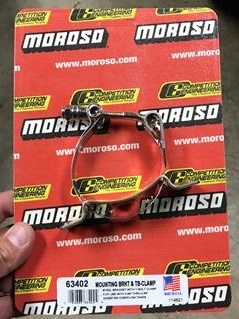 I needed the Moroso clamp to attach the can once I ground off the attached mount. The new bracket was much easier to use. 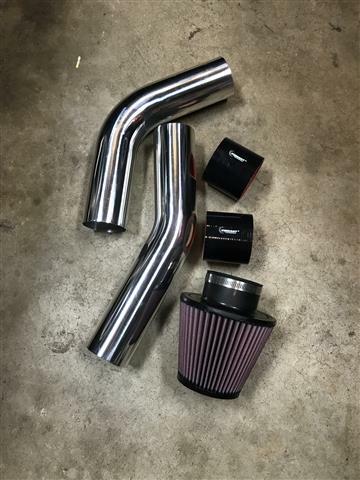 The new throttle body needed a 3″ air intake vs the stock size of 2.75″. I couldn’t find an aftermarket kit in that size and made my own using Vibrant tubing and a K&N filter. Before ordering, I used a protractor and eyeballed the angles I needed. I used a 30 and 45 degree bend for the project. In the end, I probably could have used two 45’s but after more eyeballing and rough measuring, I made it work. Once I finished the intake, I worked on relocating the breather can and cutting the hoses to length. In this shot, you can see the new O2 sensor wire I’m routing through the engine bay. Why am I showing you this? Old Car Problems…that’s why. This is one of the VSS wires. 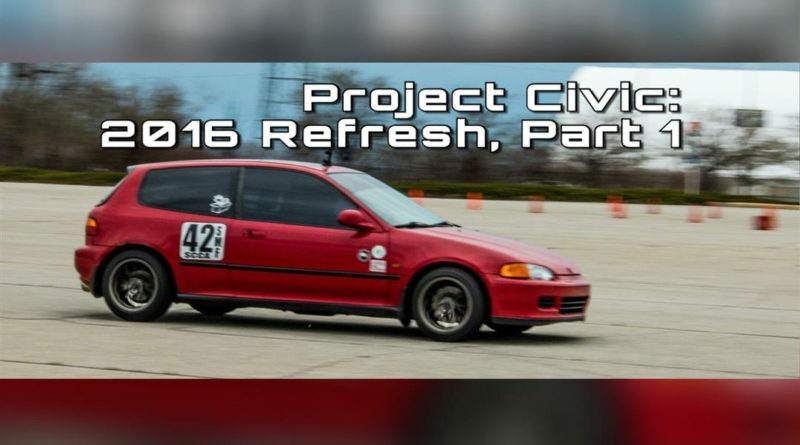 When I took the Civic for the first test ride, I had a CEL and no speedo. I had already tried cleaning the pin prior to taking this picture making it hard to see the corrosion. 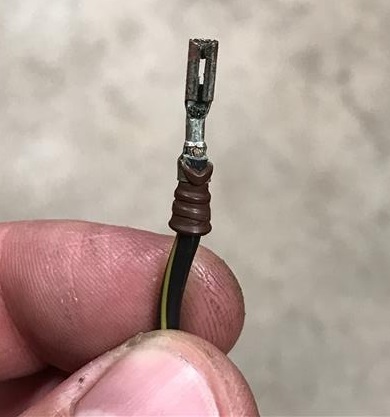 I spliced in a new pin from a spare harness and used connector grease to keep it from corroding in the future. Prior to heading out to the dyno, I decided to go through the engine to make sure everything was ready. I found that I may have been off a tooth on the timing belt (I’m really not sure on this one…but better safe than sorry), and went through the valve lash. I also swapped out my replacement distributor from last year for an OEM distributor. It’s amazing to see a 20+ year old distributor work better than a brand new aftermarket unit. I installed the PLX SM-AFR Wideband DM-6 Gauge Combo. Mikey Singhaseni highly recommended PLX’s unit. It provides a signal that feeds into the ECU allowing the Hondata to control A/F using the wideband rather than the original narrow band unit. Once all of the new parts were installed and the maintenance work complete, it was time to head to the dyno. Mikey had to reschedule my dyno appointment which put me in a bind. I had an autocross the following weekend and didn’t want to run it without a tune. Mikey put me in touch with another tuner who helped generate a base tune using datalogs. After passing data back and forth over email for a few days, the tune was good and safe to run hard. The only issue I had was rapid throttle tip in which only revealed itself during autocross runs. The wideband would bottom out on the rich side causing the car to hesitate. Not to worry, my time on the dyno was a few days away. 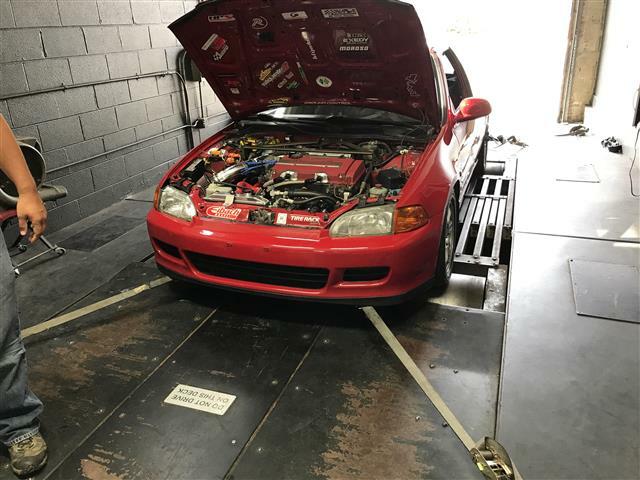 Mikey uses Performance Solutions’ Dynojet dyno outside of Chicago. 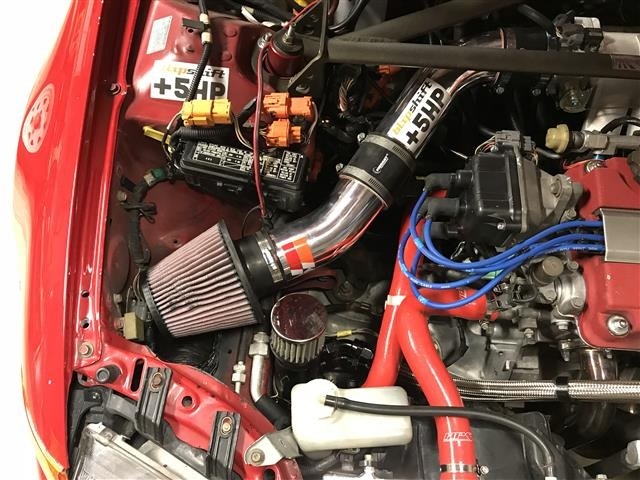 After adjusting the fueling parameters during throttle tip in, he ran a few pulls, made minor adjustments and landed on a peak of 180 whp at 7800 rpms. I never got a copy of the dyno curve so you’ll have to take my word on the numbers. I would agree that they are a bit optimistic for a 20 plus year old engine with basic bolt-ons. 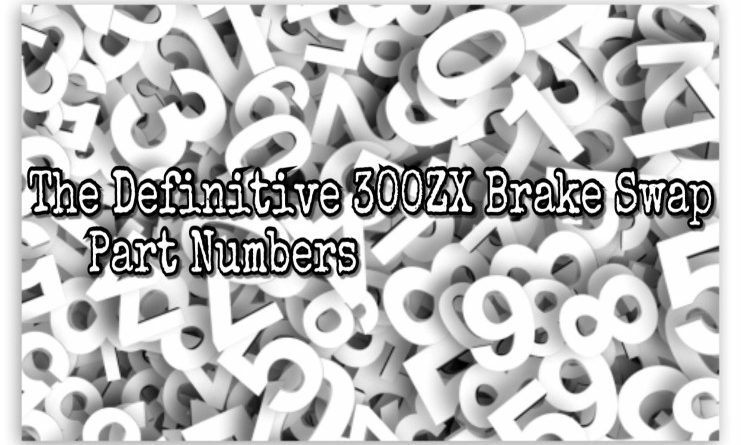 I’m sure the number would be more conservative on a Mustang dyno or something similar. 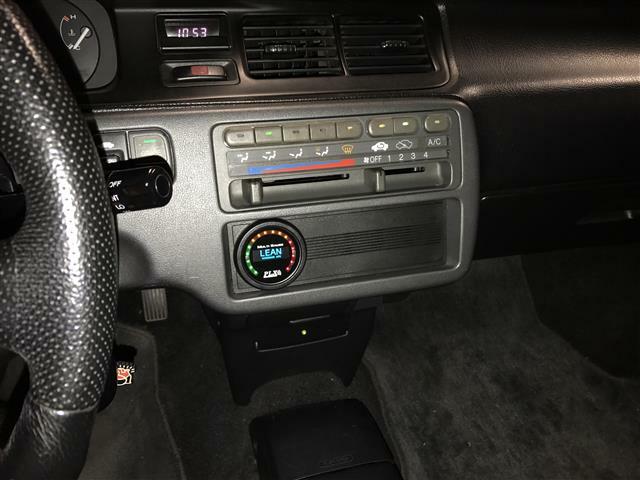 The more you know…I added an AEM oil pressure gauge and a PLX fluid temperature sensor. The ability to read two sensor inputs swayed my decision to use the PLX temp module. 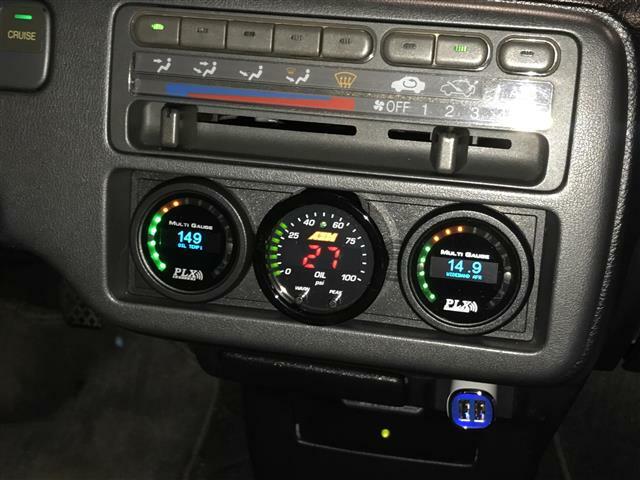 It reads oil temp and water temp. Mikey suggested that I feed air to the filter. 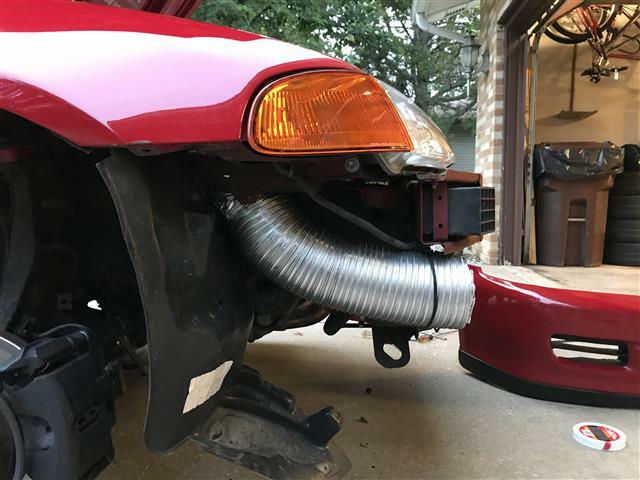 The location behind the light can suffocate the intake and proved it by turning the intake up and gaining a little more than a horsepower as a result…I used a 4″ dryer duct, along with some creative cutting of the fake air intake in the bumper to feed the air intake fresh air. I wanted to move the air filter over the new dryer duct. I had to move the ABS fuse box out of the way to make room. I’m tempted to get more tubing with different angles to square up the filter and then make a wall around the filter. Maybe next year. I would love to say that all the work made a huge difference. In reality, the changes were subtle. The engine still makes good torque and power even though I dumped the dual runner intake manifold. Was it better? My autocross runs felt stronger than I ever remembered. Better power delivery in the mid-range helped me edge further up the overall results at my events. Power gains aside, one very big difference was the improvement in throttle response. Overall, I’m glad I did the work. Any future work I chose to do on the engine will benefit from the parts I installed this summer. 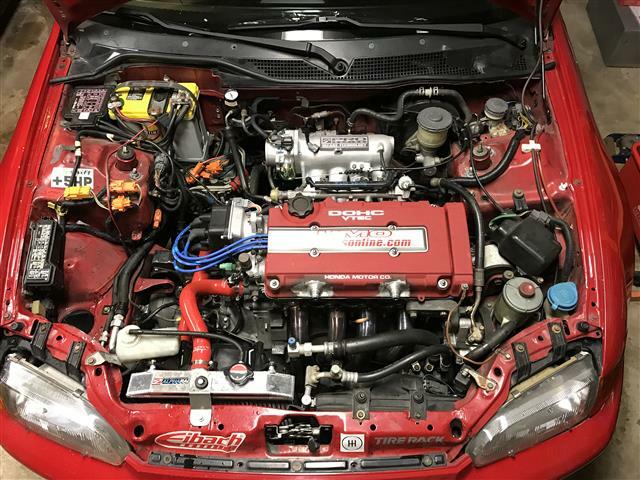 During my discussions with Mikey, we talked about a mild build to freshen the untouched 20+ year old engine. 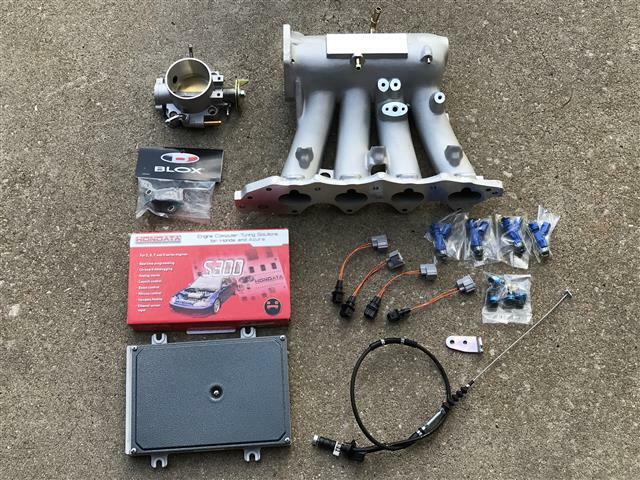 Fresh internals, head work, cams, etc, etc….it’s that whole slippery slope of modifications. If I can keep the engine together for the next few years, I may be more amenable to a build. Unrelated to the Civic: Over the past few years, I’ve thought about the fact that I’ve been driving and building this Civic (and the coupe before it) for nearly 24 years. I’m very comfortable with it and can drive it at the limit like it was an extension of my body. However, I want to try something different to hone my driving skills. Something RWD. I miss my old 240SX and in some ways wish I still had it. I have no intention of buying another and I can’t afford another project car even if I sold my Civic. 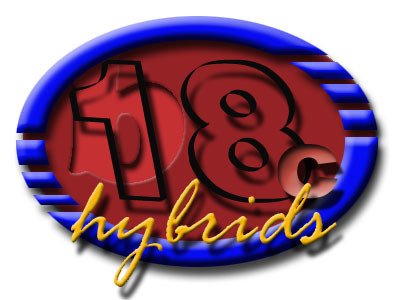 In order to accomplish the idea of trying something different, I’ve asked to co-drive a friend’s Firebird next season. I’ll chip in for mods/tires for the season which will be significantly cheaper than starting from scratch. I look forward to the challenge! Next year: If all goes well, I hope to keep my Civic expenses to a minimum with fresh brakes and track-day fun. Here’s to hoping!